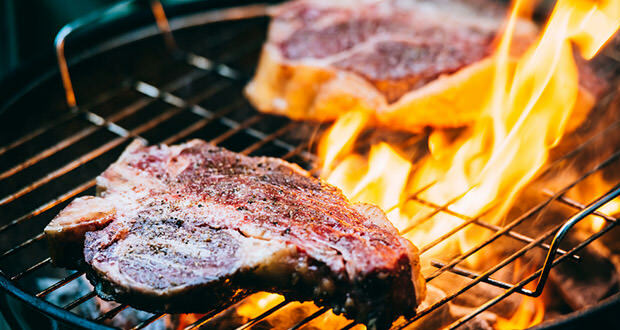 This post is part of our 50 Campfires series, 9 Rules for Flame-Cooking a World-Class Steak, giving you a complete guide to one of the best camping meals imaginable. Below we’ll explain the ins-and-outs of seasoning a steak to perfection! Season your steaks with kosher, sea, or rock salt rather than table salt. There are several reasons. First, natural salts don’t have iodine added, and you don’t want to taste iodine in your steak. Second, the larger salt crystals are less soluble, so the flavor or the salt will stay on the surface of the steak rather than permeating it. Third, it is “less salty” by volume – there’s less salt by weight in a teaspoon of large grain sea salt than there is in a teaspoon of table salt. For the ultimate flavor experience, avoid the “prepackaged” flavored salts like garlic salt, onion salt, seasoned salt, etc. If you want to add these flavors to your steak do it yourself with ingredients/seasonings, you can verify freshness, and you can control the amount. Smoked salts are an up and coming gourmet trend. You can buy smoked salts from specialty purveyors like the Salt Works in Washington State or make your own. It’s amazing the varied flavors provided by salts smoked with different kinds of wood. Hopefully, it’s a given you’ll be using freshly ground black pepper on your steak. How coarse to grind the pepper is largely up to personal taste. For a preparation of the traditional steak au poivre, the ideal grind is just breaking each peppercorn in half and not much more. Best advice is: Use what you like. The question is: How do you figure out what you like until you try it? High-end steaks don’t need much more pre-seasoning than salt and pepper. If you want to introduce other flavors, better to do it on the backend with the right sides and sauces. If you want to try a seasoning mix or rub, do it on a less expensive cut of meat before breaking out the Porter House. Salt and pepper your steak an hour before cooking. Seasoning can be done as soon as you get it out of the refrigerator to come up to ambient temperature.